More and more people are renting as opposed to buying, as renters have now outnumbered buyers in most large American cities. Renting offers the tenant a number of advantages of renting compared to buying that align with many contemporary values, like the flexibility to move. It's also a much cheaper option than owning given how expensive the real estate market has become and the property taxes you are required to pay. However, a rental lease comes with its own set of problems. The relationship between landlord and tenant can be a combative one, so make sure you brush up on your rights before you sign any rental lease. Tenant rights do tend to vary from state to state so make sure and check that these apply to your state. Depending on your state, your landlord is required to give their tenant either 24 or 48-hour notice before entering the property for any reason. Many times a landlord will want to spring an impromptu maintenance check in order to make sure everything is in working order. This may seem harmless enough but it can be a severe invasion of privacy. Landlords also use these checks to see if the tenant is doing anything that would break your rental lease, like keeping an undisclosed pet or having one too many roommates. Make sure the landlord issues you a Landlord's Notice to Enter form before they try and schedule a visit. A rental lease will usually include a provision that puts the onus on the property owner to make any repairs that might endanger the health of the tenant. However, if a landlord refuses to make these repairs or ignores your request, the tenant has the right to withhold their rent until the repairs are made. If all of these conditions are met, you are in your legal rights to withhold rent until the repairs are made. A typical rental lease will have a security deposit attached wherein an additional sum of money is paid to the landlord with the understanding that it will be returned to the tenant when they move out. Security deposits are usually used to motivate tenants from moving out before paying rent or to damage the property while living there. However, the tenant has a right to a receipt for the deposit. This document will help you to establish what you are owed in the event the landlord forgets. If the tenant wishes to break the rental lease early, they can do so if that tenant has found someone else who can take over the rest of the tenancy. The tenant can do this even if the landlord refuses to let the lease be reassigned. In this case, the tenant can issue a Tenant's Notice to Terminate the Tenancy no later than thirty days after the tenant first asked if the lease can be assigned. As long as thirty days notice is given and the landlord has no substantial reason to refuse to lease to the suggested assigned tenant, the tenant is legally allowed to break the rental agreement. 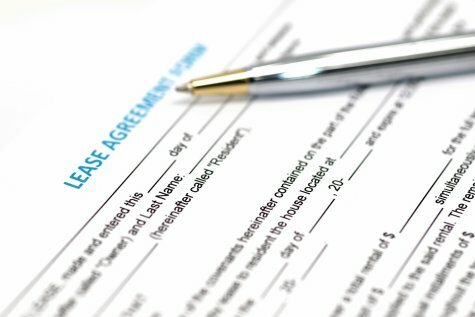 Landlords must give their tenants a written seven-day notice of eviction and they must state in writing the reason for the eviction. Most evictions are due to a material breached of a lease wherein the tenant has violated one of the key conditions in the lease. However, even after the seven days are up, a landlord is not legally allowed to kick a tenant out of the property, change the locks, or shut off the utilities. Landlords must first go to court and request a hearing. This gives the tenant an opportunity to present their case in court. A landlord is unable to legally evict a tenant without this court order. When the living space is shared between the landlord and the tenant, such as through a roommate arrangement, things can become a little more personal and thus more complicated. However, the landlord is not allowed to restrict access to common areas like the living room. Furthermore, landlords must abide by the rules established in the lease. These rules cannot be altered or created based on how the tenant is behaving. If the tenant is diagnosed with a physical or mental impairment that will interfere with major life activity for a period of six months or more they are considered to possess a disability. In some cases, a health care provider will prescribe a service animal as a means of medication. If the tenant is in need of this service animal, a landlord must waive their no pets policy or any additional fee for having a pet. If the lease does not specify a specific late fee, the landlord is not allowed to impose one. Some states will even restrict the amount a landlord can legally charge for a late fee. If the late fee is over five percent of the total rent, the landlord can be in murky legal waters. If the landlord has agreed to pay for utilities or include them in the rent, the house must be kept cool or warm enough as not to endanger the tenant. For example, it is illegal for the heating system to not be able to heat the house to at least 68 degrees when it is 20 degrees or colder outside. If the heating system or any of the other utilities covered in the rent fail to work properly, the tenant could be allowed to withhold rent until the issues are resolved. Remember that tenant rights vary from state to state so it would be wise to conduct some extra research. And above all, make sure that a rental lease with clearly defined parameters is established in writing and signed by both parties.